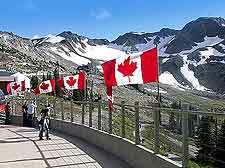 Currently ranking as one of the premier ski resorts in the whole of North America and attracting more than two million visitors per annum, the Whistler area does also offer plenty in the way of summer tourist attractions and appeal, including year-round skiing and hiking. 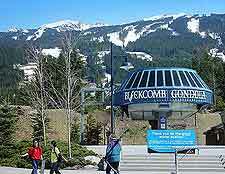 Blackcomb Mountain and Whistler Mountain serve as the region's main ski resorts and will play co-host to the Vancouver 2010 Olympic Winter Games, with the resort enjoying much upgrading and development in preparation for the expected Olympic crowds. If you are arriving from the south, Whistler Creekside is likely to be the first resort that you encounter, being home to a useful tourism information outlet on Lake Placid Road, where hiking maps are readily available. Close by and off the Village Gate Boulevard, Whistler Village is the main resort and most of what you see today dates back just a few decades, to the eighties, and includes a large collection of shops, giant hotel complexes, many pedestrianised areas, plenty of aprés-ski pubs, and an undeniable mountain-style, fairytale character. Despite is extreme popularity, Whistler manages to feel relative uncrowded, with tourists being spread around its 200+ hiking trails and outdoor Alpine attractions. Gondola rides are always popular and transport passengers high into the mountains, offering breathtaking views along the way. However, for the very best aerial views, do consider taking a flying tour of Whistler, where you will see mountain lakes and glaciers from a very different perspective. In the summer, the beaches around Alta Lake are especially appealing, while for families, the Adventure Zone at the base of the Blackcomb Mountain is quite unbeatable. Thrill seekers can even enjoy an afternoon of Bungee jumping or whitewater rafting. 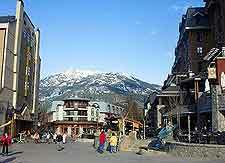 More information about Whistler Tourist Attractions. Whilst skiing has become the mainstay of Whistler, the resort is home to a popular history museum. Located on Main Street, the Whistler Museum and Archives Society is worth of a little time and filled with local information. If art is more your thing, then plenty of quality art galleries and crafts shops are on hand, including the excellent Whistler Village Art Gallery, which actually features no less than two gallery spaces, one at the Hilton Hotel and the other at the Four Seasons. More information about Whistler Museums and Whistler Art Galleries. Close to Whistler, many tourist choose to visit the town of Squamish. Renowned for its rock climbing, Squamish is also known for its huge concentration of Bald Eagles, which gather here each winter in large numbers. 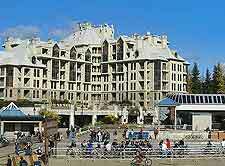 The city of Burnaby is another popular day trip, as is the Garibaldi Provincial Park, the village of Pemberton, and the Sunshine Coast, next to Horseshoe Bay. 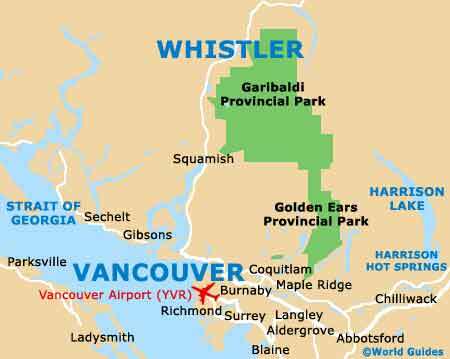 However, if you have time, then two cities are within reach of Whistler and really do deserve an excursion. Vancouver has long been one of the most popular of all Canada's tourist magnets, with endless museums, attractions and parks, including the Queen Elizabeth Park and Stanley Park. The city of Victoria lies to the south, on Vancouver Island, where it serves at the capital of British Columbia. 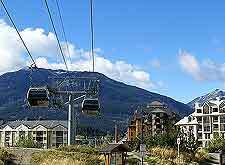 More information about Whistler Attractions Nearby.